"A traditional cuisine restaurant and a well-stocked wine bar"
Hotel Borghetti in Parona di Valpolicella, by the city center of Verona includes a restaurant that features traditional cuisine and a well-stocked wine bar. Harmoniously reflecting the enogastronomic tradition of Valpolicella, a famous destination for gourmet food lovers, the hotel's popular restaurant offers a rich à la carte menu: Italian and local cuisine, featuring homemade main courses, flavorful meat dishes and sampler menus coupled with wines. Our cellar boasts hundreds of brands that range from the DOC-labeled wines from Valpolicella to a selection of precious Italian and foreign wines. The restaurant, which can accommodate up to 100 customers, is open Monday-Saturday (12-2 PM and 7:30-9:30 PM ) and closed on Sundays. 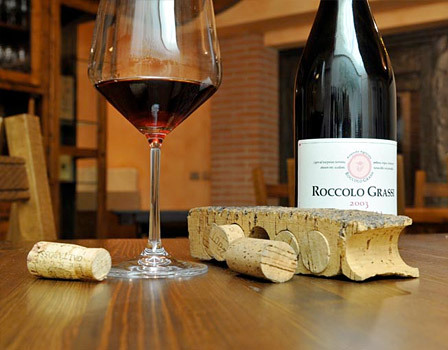 Recioto: this velvety red wine captures tradition and the scent of the Valpolicella vineyards. Excellent when served with sweets, such as Sbrisolona cake or Pandoro di Verona. The important Amarone DOC red wine has been a favorite since the beginning of time thanks to its full, robust flavor. The Valpolicella “Ripasso”, and intense ruby-red wine was created with a peculiar technique and it is in high demand also for its excellent value. The Valpolicella Superiore, more aged and structured, marries particularly well with roast entrees and game. The Valpolicella Classico, a fresh young wine, is produced exclusively in its oldest area of origin. Ideal to serve with white-meat dishes and cheese.